Big Daddy Boomerangs is a proud member! 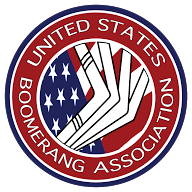 Early boomerangs were used for hunting and were a non-returning type of club or throwing stick. Other names for these types were called "kylies" or "throwing sticks". They were aerodynamic in nature, by the fact that they could be thrown for long distances without following the typical parabolic or curved path that most thrown objects follow. Therefore early hunters, who probably discovered this by accident, were able to hunt small game from a distance with relative accuracy. It is speculated that the more modern "returning" type boomerang was also discovered "by accident" with lighter weight natural elbows in wooden roots or branches. Eventually this was developed into a more recreational boomerang. There are some accounts of returning type boomerangs being used for hunting and trapping flocks birds either by throwing a boomerang into a flock or using the boomerang as a mock "bird of prey" to scare the birds into waiting nets. Other stories include boomerangs being used a percussion devices and in ceremonies and rituals of different cultures.